During the 2009 Indiana corn harvest, livestock producers heard numerous reports of mycotoxin levels high enough to cause concern. The main mycotoxins in feed grains that sheep and meat goat producers need to be concerned with are deoxynivalenol (DON) and zearalenone (ZEN). Deoxynivalenol is also known as vomitoxin. Zearalenone arises from Gibberrella ear rot, or Gib ear rot. 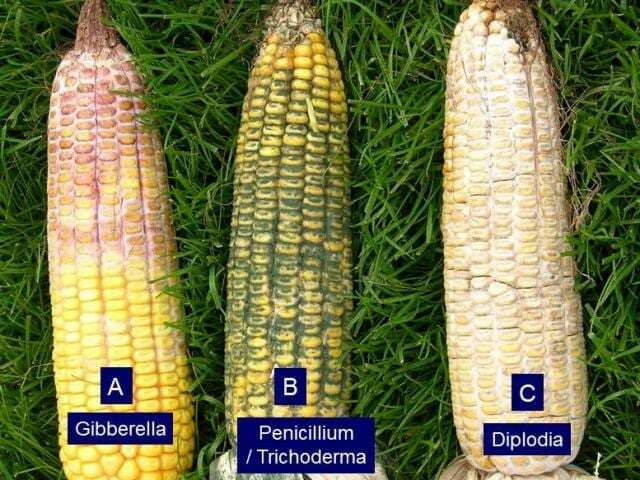 Both of these mycotoxins are produced by a Fusarium fungus. There is a limited amount of research and extension information available on the effect of sheep performance when consuming feeds infected with DON and ZEN. There is less information for goats. This publication gives an overview of how sheep and goat producers can avoid problems with these mycotoxins. Vomitoxin doesn’t seem to be as much of a problem in ruminant animals as in swine. Vomotoxin is also not as big of a concern in sheep and goats as ZEN. A report from South Dakota State University indicated that lambs on finishing diets with less than 10 ppm DON in total diet dry matter grew as well as lambs on diets with no DON contamination. A report from the University of Minnesota indicated that diets containing 15.6 ppm of DON did not depress feed intake, average daily gain, or feed efficiency in finishing lambs. A publication from the University of Kentucky reported that sheep could tolerate 10-15 ppm of DON in total diet dry matter. A report from Kansas State University indicated a maximum allowable diet dry matter content of 5 ppm DON for sheep and beef cattle during breeding season and for bred females. There is less information available about tolerance of DON by meat goats. However, since the first sign of DON levels rising beyond a tolerable level is feed refusal, and goats are notoriously finicky eaters, the problem may be self-limiting. Combine that with the act that goat kids aren’t usually finished on the type of high grain rations that lambs and beef calves are fed. Goat kids are usually fed a higher proportion of roughage and lower proportion of grain than lambs and calves, and they are marketed at lighter weights, relative to mature size. A reasonable inference could be made that DON levels for growing and finishing goat kids would be similar to sheep and cattle, though palatability issues may arise sooner with goats. ewes fed diets containing 12 ppm of ZEN for 10 days prior to ram introduction negatively impacted fertility, prolonged estrus behavior, and reduced ovulation rates. Smith et al. 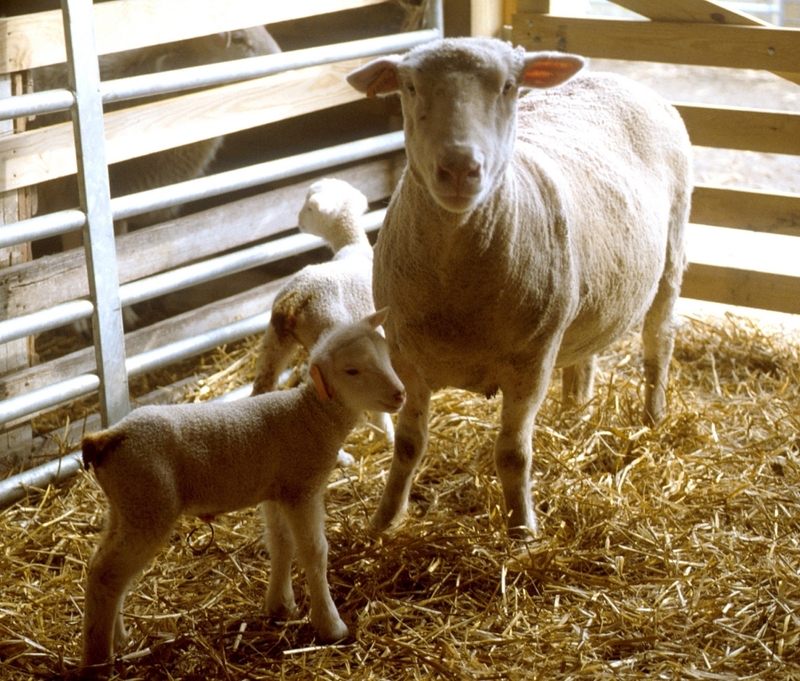 (1991) reported that ewes fed as little as 1.5 ppm ZEN 10 days pre-breeding and 0.5 ppm 20-40 days pre-breeding had reduced reproductive performance. Reed (2001) from Australia reported that a ZEN intake as low as 1 mg per day reduced ovulation rate by 20 percent in ewes. Less clear is how much ZEN ewes can tolerate without reproductive problems during pregnancy. Smith et al. (1991) found no effect on embryo survival or lambing performance when ZEN was at 12 ppm diet dry matter for 10 days immediately post breeding. DeWolf et al. (2008) recommends a maximum concentration in the diet of 5 ppm for bred ewes and beef cows. Research and recommendations on ZEN content in breeding doe diets is lacking. A reasonable estimation would be that does are probably less affected than are ewes by ZEN content at breeding, and probably rank between beef cattle and sheep in regard to ability to tolerate levels of ZEN. However, since many goats are seasonally polyestrous and ovulate multiple ova like sheep, a prudent recommendation would be to set maximum goat pre-breeding levels of ZEN similar to levels set for sheep. Many sheep and meat goat producers utilize the practice of feeding diets with extra energy (flushing) 20-40 days before breeding to increase ovulation rate and fertility in females. The most common method for achieving this is to feed from ½ to 1½ pounds of corn per head per day while females are grazing pasture. Because of the potential problems with ZEN in corn on reproduction, producers should know the ZEN content of corn they use for flushing in a problem year, and for the following year if old crop corn is used. The long-term exposure to ZEN and subsequent reproductive performance has not been well documented in ewes, and neither has the effect of different levels of ZEN exposure on the reproductive performance of replacement ewe lambs and doelings. Often, female replacements are fed some grain to enhance growth rate and to reach mature size quicker. The ZEN content of these diets should be known to avoid potential long-term reproductive problems in breeding and replacement stock. DeWolf, E., J. Shroyer, V. Schaffer, D. Strouts, and R. McCormick. 2008. “Head scab on wheat in Kansas.” K-State Extension Agronomy e-Updates. Di Costanzo, A. and M. Murphy. 1994. “Strategies for feeding mycotoxin and mold-contaminated grains to cattle.” Issue 32, Beef Cattle Management Update. Reed, K. 2001. “Oestrogens in pasture, hay and silage.” Department of Primary Industries, Victoria, Australia (http://new.dpi.vic.gov.au/home). Smith, J. F., M. E. diMenna, and L. T. McGowan. 1986. “Effect of Fusarium culture and zearalenone on the reproductive performance of ewes.” Proc. New Zealand Soc. Anim. Prod. 46:255. Smith, J. F., M. E. di Menna, N. Towers, and J. Sprosen. 1991. “Zearalenone and fusarium – what and where it is and its effects on reproductive performance of sheep.” In: Proc. Ruakura Farmers Conf. No. 43, pp. 194-198. Vincelli, P. and G. Parker. 2002. Fumonisin, vomitoxin, and other mycotoxins in corn produced by Fusarium fungi. Univ. of Kentucky CES publication ID-121. Whitlow, L. W. and W. M. Hagler. 1999. Mycotoxin toxicity, treatment and prevention. North Carolina State University (http://www.txanc.org/proceedings/1999/mycotreatment.pdf). Wright, C., A. Garcia, J. Held, B. Thaler, R. Daly, and M. Draper. 2005. Feeding scab-infected wheat to livestock. Extension Extra; ExEx 2047, South Dakota State University. Posted by Braden Campbell at 8:00am July 17, 2018 Posted in Health and tagged Health, Management, Nutrition. Bookmark the permalink.